Test your Professional Knowledge of Marketing with this questionnaire to prepare for IBPS Marketing Officer Examination. 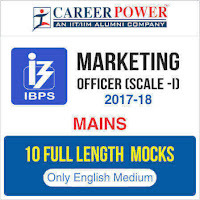 To score in IBPS SO (Marketing) Mains, the candidates must have an adequate knowledge of Marketing Planning, New Product Life Cycle, Segmentation, Consumer Behaviour, Brand Management and more. This quiz covers the important chapters of Marketing to help you prepare for the exam. Q1. In case of buying behaviour, which of the following is/are require a high involvement of the consumer in the buying process? Q2. Titan, added protective packing to its alarm clocks and claimed "?Here is a travel clock with a protective shutter. Available in 3 dial options and 4 elegant colours. "The statement points out which level of product? (a) combining products purchased from several manufacturers to create assortments. Q5. Mercedes may suggest a no-nonsense boss (person), a reigning lion (animal), or an austere palace (object). This conveys which aspect of a brand? Q6. Which of the following can be a potential cause of channel conflict in case of distribution intermediary's goal? Q7. Economic utility created by making goods available where consumers want them is defined by which of the following? Q8. Keeping customers in mind the functions performed by a marketing channel intermediary would be which one of the following? Q9. Psychographics is the science of measuring and categorizing consumer lifestyles.In this regard, the group with greater resources as according to VALS segmentation would be? Q10. Which of the following is a function performed by packaging?